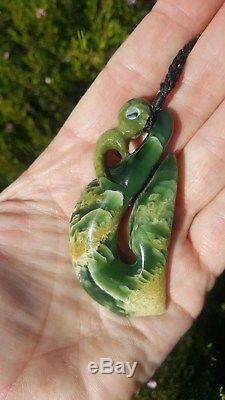 New Zealand born and based in Hokitika the Jade capital of New Zealand. Complete with black braided waxed adjustable cord. Carving has a Matt finish stunning colour. New Zealand Greenstone from West Coast South Island New Zealand. Fish Hook Hei Matau: represents safe travel over water, good health, good prosperity and strength and determination. Mania: The mania is a guardian representing balance and protection. The head of a bird, body of a man and the tail of a fish represent sky earth and sea. 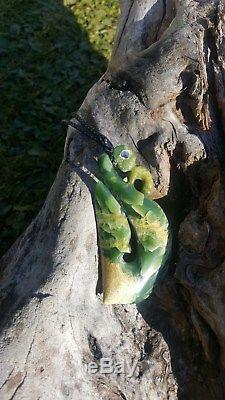 This Fish Hook has been created with a mania on the shank for added protection to the wearer with paua inset in the eye. All items are photographed in natural light no photoshop. 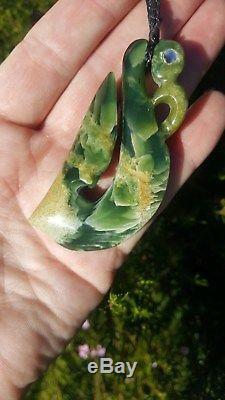 The item "Handmade Fish Hook stunning Flower Jade New Zealand Jade Greenstone Pounamu" is in sale since Friday, June 15, 2018. This item is in the category "Collectibles\Cultures & Ethnicities\Pacific Islands". 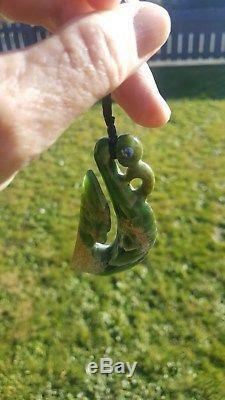 The seller is "oldedition" and is located in Hokitika. This item can be shipped worldwide.